A colony of Didemnum molle is composed of a number of linked zooids adhering to the substrate. 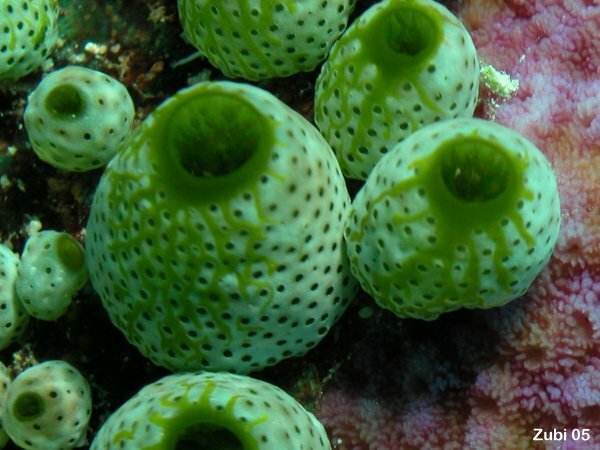 Each individual zooid has a plump, urn-shaped body with a diameter of up to 10 cm (4 in). The tunic (body wall) is made of a cellulose-like substance that is strong but flexible, and is perforated by numerous small holes, the buccal siphons, through which water is drawn into the body. At the top of the body is the large atrial siphon through which water flows out. The tunic is strengthened by the presence of many spherical calcareous spicules which are particularly concentrated round the neck of the urn. Color: The colony is white, brown or green, or some combination of these colours. This hue is due to the symbiotic blue-green algae of the genus Prochloron present in the tissues. The tunic contains mycosporins which filter out ultra-violet radiation and protect the symbiotic cyanobacteria from damage in strong sunlight. In shallow water the colonies are small, the colour is more intense and there are more spicules present making the external surface bright white. At greater depths the colonies are larger, there are fewer spicules and the colour is more greyish or brownish. Habitat: Didemnum molle is native to the western Indo-Pacific region where it is common and widely distributed. It grows on rock or dead coral on shallow reefs. In New Caledonia there is a green variant that grows direct onto sand.